Ahh...the mountains, they're awesome! And a mountain cabin rental is the best way to enjoy them. Wherever, you choose to vacation in the mountains, be it Tennessee, North Carolina, Virgina, Colorado or somewhere else, staying in a cabin is really the only option. If you are going to vacation in the mountains then why not stay right in the mountains. Many resorts get you near the mountains, but not right in the clouds. There are many cabins that are perched right on the side of a mountain, or down in a hollow or next to a creek. You can have your own private little haven away from the hustle and bustle of everyday life, something you won't find at a big resort. There are litterally thousands of mountain cabin rentals in various locations around the country, but only a few offer true seclusion and serenity, someting my wife and I treasure. So, as my wife and I discover various locations throughought the country we will feature them here, located by region. Look around at the various cabins that appeal to you and enjoy your stay in a montain cabin rental. 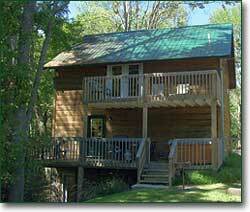 If you are looking for a Virginia cabin rental then you must have a look at the rustic Three Sisters Cabin in Montebello, Virginia. Would you like to own your own vacation property? If so, you can search the MLS in and around the Smokies or any place else for your perfect vacation home that you can call your very own!